No one knew exactly what kind of Holland they would wake up to on Thursday morning. But one thing was for sure: it depended on what they did on Wednesday. This was exactly the reaction most young people gave during their interviews right after they cast their votes in this week’s election in the Netherlands. “I am aware of the importance of this election, and I want to keep my future in my own hands,” said many an interviewee. And although most people did not go into detail, it was more than clear who they were talking about: hate preacher Geert Wilders and his xenophobic, anti-Islamic party: the PVV (Partij Voor de Vrijheid)—which ironically means the “Party for Freedom”. A huge segment of the Dutch people (81.4%) came out to vote, seemingly either against Wilders or to defend him. Election Day is over, now it is time to reflect upon the results. Reluctant headlines: Dutch reject ‘Populist Spring’! The world is reluctant. European press relief as Dutch reject ‘Populist Spring’, was the was just one of the many exciting headlines the BBC published just the day after the elections. Everyone was nervous because of Wilders’ realistic shot at becoming prime minister, breathing a sigh of relief at the result. The Muslims were happy, the lefties were happy, and even the European establishment was happy, expressed by Ms Europe (Merkel) herself who immediately called prime minister Mark Rutte to congratulate him on his (third) victory. And happy they definitely should be, as all the prognoses predicted a very possible victory for Wilders’ PVV. But Mark Rutte (who has been prime minister for years now) won the elections with 33 MPs in parliament, against Wilders’ 20 MPs. Now the first hysteria of happiness is over it would be good to take a look to the following facts. Because although Wilders not winning is a blessing from the sky, things in Holland are always more complicated than they seem. Yes, Geert Wilders did not win the elections. But he did win something. Everyone in the Netherlands is well aware that his party grew with five extra seats in parliament, making his the second biggest party. That means that Wilders keeps growing almost every year, with 325,000 more people supporting him and his views than four years ago. 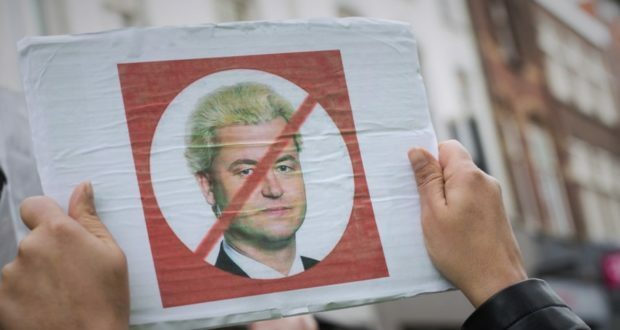 So besides the fact his presence in the political centre has become more powerful, he also made more and more people angry with Islam and Muslims, which says much about the atmosphere against Muslims and immigrants in the present-day Netherlands. But there is more. Although the Netherlands has many real problems to face, the 2017 elections were almost all about the battle for ‘Dutch Identity’. Just a few years ago the Dutch people proudly calcified themselves as the least nationalist and most self-critical country around. Dutch soberness was our national pride. Yes, we were proud not to be proud, and used to make fun of our British neighbours’ nationalism. Those times are over now. Geert Wilders’ growing popularity made all the parties attend the race for the votes of the ‘boze blanke burger’—the Angry White Citizen. And ironically enough they did this by making them even more angry. In the past six years the now ruling VVD party made use of Wilders’ right-wing attitude and the ‘concerns’ of the people to push their own right-wing agenda. The fact that Wilders was once part of that same VVD, as well as the now disgraced international Islam-hater Ayaan Hirsi Ali, tells us enough about the ruling party’s attitude towards Islamic values. 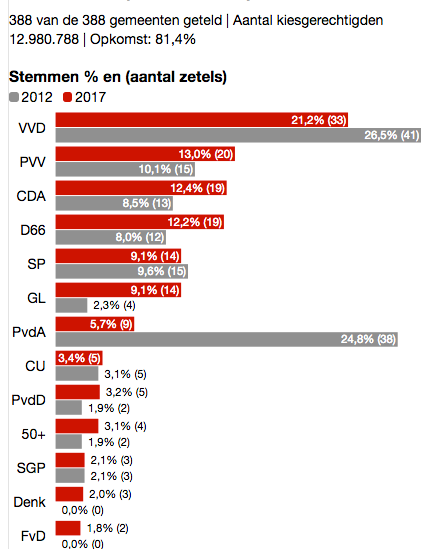 Furthermore, the other parties have also been moving more and more to the right as the PVV and VVD have become stronger. They mastered these narratives of fears, uncertainty and xenophobia, trying to win back the hearts of the angry white citizen, not by offering them a strong counter narrative of hope and inclusion, but by showing so-called understanding for their ‘worries’. And this of course—combined with international developments and the way the media dealt with them—only strengthened the anger and xenophobia of those people whose financial problems only worsened due to the neoliberal economic policies of that same right-wing. This is Wilders’ biggest victory over the past ten years. And it is exactly this which will make Wilders prime minister of the Netherlands if the current parties do not act wisely before the next elections. Here in Holland we often like to make things slightly more difficult than in other countries. This is the same when it comes to our political system. Our long-lived tradition of working together though heavily disagreeing with each other, makes it so that Wilders and Rutte are not the only big players in Dutch politics. Let us take a look at the statistics in the infographic below. Yes, we only have 12,980,788 with the right to vote. We had 29 parties to vote for and thirteen of them made it in to parliament. This Monday the race for forming a coalition will begin. Although the VVD has the right to take the lead in the process it might well become a difficult task for them. Rutte made a clear, public promise not to work with Geert Wilders, but the real question is: who wants to work with Rutte? Firstly, there are many clashes with the other big winners of the election like Christian Democrats (CDA), the Liberals (D66), the Socialists (SP) and the Green-Lefties (Groenlinks). To catch a glimpse of what the problem is, one only has to take a look at the red bar behind the PvdA (Labour Party) in the infographic. For decades this party was the one of the biggest players in the field. The grey bar shows the number of seats they had in parliament after the last election in 2012: 38! Then they joined the coalition with the right-wing Liberals of the VVD, just for the sake of governing. And look at them now. They lost almost all of their voters to other parties like D66 and Groenlinks. Now they have only 9 seats left and a huge internal crisis. They weren’t the first to be afflicted with the VVD-curse. The Christian Democrats (CDA) who joined in coalition before them, also fell down to only 13 seats after they had won the previous four elections! So, the question now is: who is to form the best coalition in a short space of time? And although he has a good chance, Dutch political history shows that it is not certain yet if Rutte himself will be the next prime minister. Understood it? Don’t worry too much if you don’t. Most Dutch people don’t understand it either. We just wait until the newspapers tell you who won the political strategy game of The Hague. Let us wait for Monday. Perhaps the most interesting thing about this election is the behaviour of the Dutch Muslims. Let us recall the aforementioned Labour Party, the PvdA. For decades the party was very popular with minorities, especially Muslims. They promoted a message of inclusivity and believed in the possibility to live together in a multi-cultural Holland. For this reason, hundreds of Dutch Muslims joined the party, each one recruiting thousands of Muslim voters for the party. But over the last few years the PvdA became more of an elite Labour Party, and the shift rightwards only made things worse. They still got many votes during previous elections under the motto ‘lesser of two (or in the Dutch case, 32) evils’, just because there was no better alternative. But during their last coalition with the VVD it went terribly wrong. They became harsher and harsher against the Muslim immigrants. Their own Muslim MPs and ministers came out with malicious initiatives like the so-called “Salafi-ban”, and defended the niqab-ban, halal-slaughter ban and many other anti-Muslim proposals and laws. But then they did something terribly unwise. They opened fire on a group which although usually kept themselves in the background, happened to be one of the biggest and strongest immigrant groups in the Netherlands: the Turks. With the rise of ISIS the deputy prime minister and head of the Labour Party, Lodewijk Asscher, was already well underway in attacking many Moroccan religious organisations, promising harsh measures in his “war against radicalisation”. But in 2014 he started to focus his attacks on Turkish organisations as well by launching a media campaign in which he made the ludicrous claim that almost 72% of Turkish youngsters feel some kind of sympathy for ISIS. Although Asscher was known to be an otherwise serious, well-respected politician, this was a claim no one could defend. And it was pointed at a target which would not keep silent. Immediately within 48 hours dozens of well-educated Turkish lawyers, academics and entrepreneurs started to fight back by organising themselves and demanding Asscher’s explanation. They immediately came to the conclusion that another party should redo the research on which his claims were based. Although the new research destroyed the former completely, and Asscher admitted the problems with the first one, he never came out with an apology, and this was something the young Dutch Turks would never forgive him for, as he continued to keep on restricting Turkish organisations like Milli Görüş and Diyanet. This last move made two Turkish politicians leave the Labour Party with a huge commotion, starting a party for themselves which would run for the 2017 elections. DENK was the name, and although Muslims were well aware their intention was not to become an Islamic party per se, they finally saw two politicians principally defending them almost every time they (or their religion) was motioned in parliament or routinely attacked in the media. DENK started a huge movement on the internet becoming the most popular political party on social media. They made many videos in which they exposed hypocrisy of MPs who for years visited all the mosques for collecting votes for different parties, but now voted for anti-Muslim bills like the niqab-ban, halal-slaughter-ban, draconian so-called “anti-terrorism” laws which affect ordinary Muslim citizens, the “Salafi-ban”, the recognition of the Armenian Question as a “genocide” (a tremendously sensitive discussion for Turks) the cutting of pensions for Moroccans who want to move back to Morocco and of course the many anti-Turkey (read: Erdoğan) restrictions. In this way they made politics in the Netherlands a great deal more transparent to those who the MPs usually considered as simple crowds of voters. They themselves went for the counter-narrative of an inclusive society and started their own social media campaigns showing how they defended their own identities in parliament and in the media, with their crown jewel being the refusal of shaking hands with Benyamin Netanyahu who was on a state visit. And the Muslims loved it. Their actions went viral and hundreds of Turkish and Moroccan organisations started joining them. From Sufi to Salafi and others, most of the organisations urged the Muslims to go out and vote this year and advised their members to vote for DENK. And although many Muslims were still a bit hesitant with the uncertainty with giving their votes to a new party, DENK won almost 200.000 votes, making them win three seats in parliament! The Dutch Muslim story gives a lot of food for thought, and one of the most important lessons is the need for uniting on common goals. Politics is about compromise and not expecting ideal outcomes for one interested-group over all others. By the Grace of Allah, many Dutch Muslims and their organisations have shown that Muslims can unite around common goals and against a common threat. Nobody naively expects that elections will bring about a utopia, but at the end of the day, we have a growing movement empowering ourselves instead of relying on the Angry White Citizen, which seeks to defend our rights, iman and identity, by the permission of Allah. Recent events in Europe and those on the horizon ahead show that Muslims are part of the fabric of Europe now, and once we all realise that and unite around common good, we can be spoken with instead of just spoken about, by the powers that be. Also read: Do Muslims Belong in the West? Keeping in mind that the official details will not be released until next Tuesday (21-03-2017) we can’t be one hundred per cent accurate for now. Selahattin is Islam21c's correspondent in the Netherlands. He studied International Politics and now works for various media websites. He is from a Dutch-Turkish background. Ma sha Allah Tabarka Allah! A great, well-written piece! Rutte deserves the loss for what his govt done to the Turkish Ministers! I was hoping you’ll mention about the further complication with the coalition deal too whereby it took them 208 days to form a coalition in 1977 and 47 days in 2012! do you have anything beneficial to add to the topic you moron? always amazes me that there are stupid trolls alleging others to be wicked!